Visit the Columbus Zoo and Aquarium where you'll meet 10,000 animals from across the globe! Spend the day exploring six regions and learning about their native species. 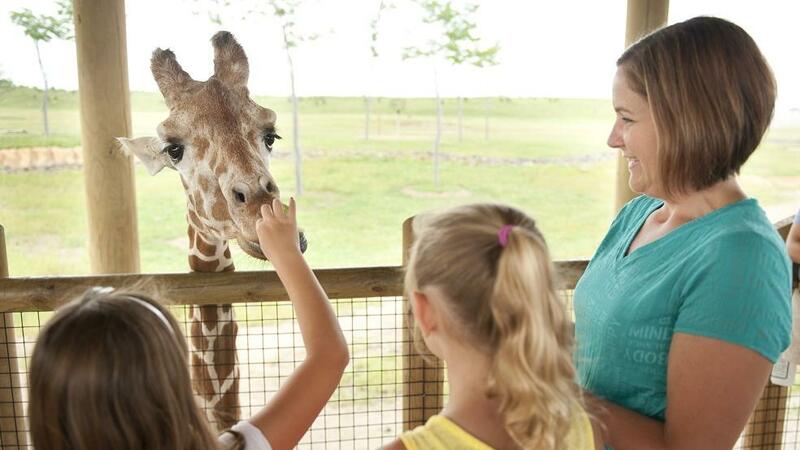 Below are just a few of the areas you'll discover at the Columbus Zoo. The Zoo's newest and largest region, Heart of Africa, opened in 2014 and features hands-on experiences like camel rides, giraffe feedings and cheetah runs. Visit with African wildlife including zebras, giraffes, lions, monkeys, wildebeests, gazelles and more. Stop in the Mapori Restaurant and enjoy views of the savanna over lunch. Visit the "coolest" habitat at the zoo and meet three new polar bear cubs at the Polar Frontier. Watch the polar bears swim, eat and play in this state-of-the-art interactive exhibit. See polar bears plunge into the 167,000 gallon pool and watch them catch trout and other treats while viewing from above, at eye-level or from below underwater! Go "down under" in the outback in the Australia & the Islands regions of the Columbus Zoo. Get up close encounters with kangaroo while hopping around in the Kangaroo Walkabout. Walk through the lorikeet garden and be surrounded by birds while they land on your arms and shoulders. Don't move to the next region without taking a boat ride through the Islands of Southeast Asia. For more information about the Columbus Zoo & Aquarium, visit www.columbuszoo.org. January - March: 10:00 a.m.- 4:00 p.m.
April - May: 9:00 a.m.- 5:00 p.m.
June - August: 9:00 a.m.- 7 p..m.
September: 9:00 a.m.- 5:00 p.m.